Thanks to you, we now have 300 likes on the Bimeda Facebook page. We need 700 more by September 1, 2014, to raise $1,000 to help certify professionals and accredit centers. It couldn't be easier! Click the link, like their page, and feel great for helping PATH Intl. Thank you! If you haven't yet visited the PATH Intl. Facebook page, join the more than 7,000 friends and like PATH Intl. as well! Do you have a great story? How did PATH Intl. and therapeutic horsemanship change your life? Share your stories with us by emailing them to Megan Ferry. You never know, you may see your story in print! Thank you. This remarkable video tells the stories of three separate individuals who have been touched by the power of therapeutic horsemanship. A former world-class equestrian champion disabled by a stroke, a veteran of the Iraq and Afghanistan wars diagnosed with post-traumatic stress disorder and a teenage boy on the autism spectrum, along with his younger brother, all share their journeys of hope and healing through their work with equine-assisted activities and therapies horses. These miracles are happening at an otherwise typical barn in a PATH Intl. Member Center in Loxahatchee, FL, known as Healing Horse Therapy Center, led by a woman whose passion it is to help those in need of healing make the ultimate connection between horse and human. Enjoy the video! PATH Intl. is proud to offer two scholarship opportunities for veterans of U.S. military service in order to promote their continued growth and to give back to them for their service. 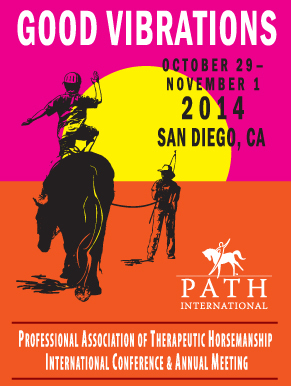 The PATH International Equine Services for Heroes Conference Scholarship for Veterans will award one conference registration to the 2014 PATH Intl. Conference and Annual Meeting in San Diego to a veteran. The PATH International Equine Services for Heroes Therapeutic Riding Instructor Certification Scholarship for Veterans will reimburse to a veteran the cost of pursuing PATH Intl. Therapeutic Riding Instructor Certification. Visit the website for information and applications. Bid on an Equicizer for Your Center! We are pleased to announce that Equicizer has renewed their pewter-level sponsorship of the PATH Intl. Conference and will once again donate a Classic Equicizer to be auctioned prior to the annual banquet. This is an excellent opportunity to get one for your center, so come prepared to bid. Thank you, Equicizer! On Thursday, those who are new to research will learn how to conduct measurable and meaningful research in Armed and Dangerous: A Stockpile of Valid Methodologies for Freshman Researchers with Dr. Manette Monroe and Thomasa Sanchez. Our new "Good Vibrations" track will offer attendees an outlet for self-expression through art in Barn Art, led by professional illustrator and PATH Intl. Instructor Priscilla Marden. Keep an eye out for more conference highlights and fun things to do in San Diego! If you are interested in sharing a room with someone at the conference, PATH Intl. maintains a roommate/share list on the My PATH Intl. Membership page. While we will not match people up, we do provide contact info of people who are looking to share expenses. For more information, email Megan Ferry or call her at (800) 369-7433, ext. 107. Click here to register and pick your sessions. If you registered through the special promotion, you may now go in and select your sessions. Early bird registration is open through September 17. The hard copy registration booklet and form was polybagged with the summer issue of PATH Intl. Strides, so check your mail, or you can click the cover of the registration book (left) to open in your browser. Dr. Paul Spiers, who served as PATH Intl. 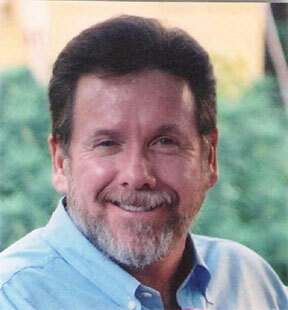 Board of Trustees President from 2006 to 2008, was an accomplished rider and a polo enthusiast. After an injury in 1994 while on a hunt, Paul used a wheelchair and rehabilitated in part at Windrush Farm Therapeutic Equitation, Inc., a PATH Intl. Premier Accredited Center in North Andover, MA. Paul, who passed away September 2013, had a great passion for PATH Intl. and championed its programs and initiatives in helping individuals to overcome challenges and gain independence. To honor Paul Spier's passion for therapeutic horsemanship, his friends are working to name the PATH Intl. Independent Adult Equestrian of the Year Award in his name in perpetuity. To date, $3,150 has been raised, and we need $5,000 by September 10 to name the award (only $1,850 to go!). Please join us and donate today! PATH Intl. congratulates Patti Andersen, a volunteer at Heroes on Horseback, a PATH Intl. 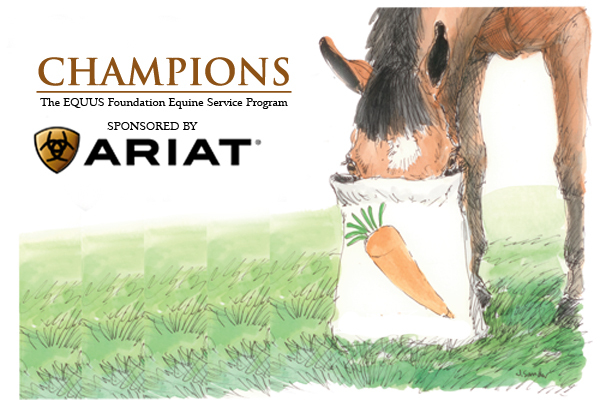 Premier Accredited Center in Bluffton, SC, and Mary Rush, a volunteer at Free Rein Therapeutic Riding, a PAC in Spokane, WA, for winning Ariat Champions grants through the Equus Foundation. Heroes on Horseback received the First Place $2,500 grant thanks to Patti's volunteer efforts; and Free Rein received the Second Place $1,500 grant for Mary's volunteer service. Congrats to both of you! Thank you to everyone for their participation in the Rein Them In Member-Get-a-Member drive. As a result, PATH Intl. members recruited 176 new individual members! Susan Lutz from Region 5 won the pick-a-trip weekend package. Deana Hamel from Region 6 won the $100 gift card. Jan Pollema from Region 10 won the drawing for the free conference registration. Remember, every time you recruit a new member, you strengthen your membership association. A vital and growing PATH Intl. means greater recognition of safety and ethical practices in the equine-assisted activities and therapies industry, improved education resources and networking opportunities, and the advancement of professional standards worldwide. Thank you for continuing to make us a strong association! Have an interesting seminar idea or are you a speaker yourself? The American Morgan Horse Association Convention Committee for the 2015 Awards Gala and Convention being held in Minneapolis, MN, February 27-28, 2015, is looking for your ideas and invites you to be considered as a speaker for this event. Submit your topic, short summary for your presentation and a bio for consideration to Julie Dickie, AMHA Membership Development Specialist, by September 2nd. As the assistant manager of a thoroughbred breeding farm, one of my most enjoyable (and most challenging) responsibilities was working with the foals and weanlings. I learned what does work from a great manager, a few amazing barn hands, a wonderful farrier, an extraordinary vet, and of course, from the horses themselves. Equally as important, I learned what doesn't work from some ignorant owners and a few self-proclaimed "experts." After watching one of those "experts" chase, terrify and intimidate the foals as she cornered them and wrestled the pastewormer into their clamped-shut mouths, my first thought was that she may have managed to get the stuff into them THIS time, but how would they react the NEXT time they saw her approach with tube in hand? There had to be a better way. Read more. Meet Daisy, the SmartPak PATH Intl. Horse of the Month for July. Daisy is an EAAT horse at Hearts & Hooves, Inc., a PATH Intl. Premier Accredited Center in Sherwood, AR. Congratulations, Daisy! Hearts & Hooves will receive one month of SmartSupplements. SmartPak is looking now to choose the next Horse of the Month, which will receive $100 of SmartPak products for a month. Nominate your horse in August for a chance to win! Photos are highly encouraged! For more information about the champions program, the PATH Intl. Scholarship and how PATH Intl. members can achieve champion status by volunteering, visit the EQUUS Foundation website. Join Us in Welcoming These New PATH Intl. Centers! Welcome to these two centers who have joined the PATH Intl. family! If you would like information on starting a center, visit the Centers page or contact Stefani Viktora-Anderson. Unless otherwise noted, contact Denise Fager at (800) 369-7433, ext. 114, with questions. All dates are subject to change. To register for an event, please contact the host site directly. You can locate contact information under Find a Center on the PATH Intl. homepage or on the PATH Intl. events calendar.